The Woman of the Year Program acknowledges those individuals who have made a difference in their communities. Woman of the Year is usually presented as a local program during BPW’s Business Woman’s Week and usually in the month of October. 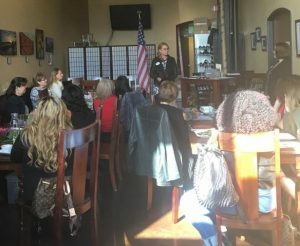 The women that are honored, which can be as few as one, must be working full time and be an active contributor in her community (e.g., mayor, business owner, community activist). She is chosen by a Local BPW. 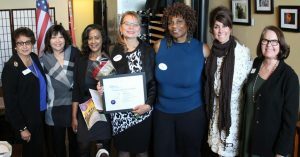 The Renton Business and Professional Women’s Organization, at their October meeting pictured right, selected their “Woman of the Year.” There were 5 nominees. The nominees were Minyhu Tafesse, owner of Abyssinia Beauty Clinic in Renton; Ester Alley, Owner of Ester Jones Alley Coaching; Lisa Fischer, Lisa Fisher Styling, LLC; and Cici Sawyer, Towelocs and Wholesale Real Estate. Woman of the Year was selected by Vicki Baxter, CEO, Renton Chamber of Commerce; Linda Foley, Director, and Rich Sweeney from Rich Printery. To be selected is an honor and each nominee is a winner in her own right. The Renton 2017/18 Woman of the Year is Angel Gonzales, an Air Force Staff Sergeant Veteran. She is employed by the Washington Department of Veteran Affairs and mentors Veterans and their families members. She established the first VetCorps position at City University. Angel has won many awards that support our veterans. She also has two sons in the military serving in the middle east. Pictured from left to right: Women on the Year Chair Irene Roberts, Cici Sawyer, Minyhu Tafesse, Angel Gonzales, Ester Jones Alley, Lisa Fischer, and Renton BPW President Peggy Harris.